Quicksilver commenced the first daily cruise to the picturesque Low Isles in 1979. The coral island is as beautiful as it is significant in Australian history. Low Isles and its historic lighthouse were registered on the Commonwealth Heritage List in June 2008 in recoginition of their place in Australia's cultural and Indigenous heritage. 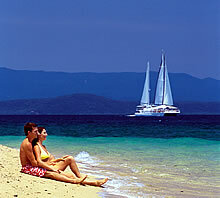 Only 1 hours sail from Port Douglas. Unspoilt coral cay with shady trees and a protected lagoon. Often see turtles underwater, excellent island bird life. Island history - lighthouse, the most comprehensive year long study of a reef in 1928/29 by scientists. Fresh prawns & more for lunch. Company culture of safety innovation, quality safety equipment. Qualified safety crew with regular ongoing training in advanced first aid.